In Episode 3, The Crowd & The Cloud travels back to 19th century London for an early citizen science success story. Scroll down to learn more about the people and projects featured in this segment. Mapping clues to find a killer. In the mid 19th century, London was the largest city on Earth, with a population of more than two and a half million. And where there are travelers, there are often deadly diseases, often reaching epidemic proportions. Medical historian Richard Barnett guides us through the streets of London to tell the story of how medical detective work tracked down the water-borne causes of cholera. The first outbreak in 1832 killed more than six thousand people, and was followed by another in 1848 that killed sixty thousand. The causes of the disease were misunderstood until—in 1854—the celebrated physician John Snow, and a little-known clergyman, Henry Whitehead, found an entirely new way to think about the disease, pounding the pavements and talking to neighbors, until they discovered its cause. It’s a story of persistence, map-making and local knowledge solving a deadly epidemiological mystery with approaches that can now be mobilized with cellphones, sensors and crowdsourced disease data. Mapping is a powerful tool for understanding the spread of diseases. Author Steven Johnson gives a 10-minute tour of his book about a cholera outbreak in 1854 and the impact it had on science, cities and modern society. Articles and additional reading on John Snow, the Father of Modern Epidemiology, his life and work. John Snow is viewed by many as a pioneer in disease mapping. 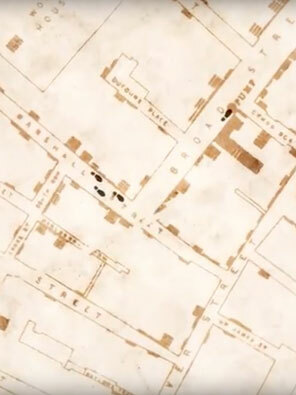 For the 1854 cholera outbreak in London's Broad Street region, he presented these maps. Edward R. Tufte’s take on John Snow’s disease map. A collection of caricatures and cartoons depicting historical figures. Richard Barnett’s personal homepage, with history books, essays, guided tours of London, and even poetry! “The Sick Rose” is a visual tour through the golden age of medical illustration in the nineteenth century. HealthMap, a team of researchers, epidemiologists and software developers at Boston Children's Hospital, is a global leader in utilizing online informal sources for disease outbreak monitoring and real-time surveillance of emerging public health threats. The Skoll Global Threats Fund’s mission is to confront global threats imperiling humanity by seeking solutions, strengthening alliances and spurring actions needed to safeguard the future. Together, we will end pandemics in our lifetime.